May has been full of many miles traveled and several ministry and family events. I started in Richmond, Indiana at Camping World where we had several severe issues that we repaired. While there, Hillcrest Baptist Church recorded one dialogue with Rawley which will be aired on the local Christian tv channel. I joined Jane in Omaha and our son Caleb and Angel were married on May 12, 2018. On Sunday night, May 13, we gave a ministry update to Temple Baptist Church in Omaha, Nebraska. 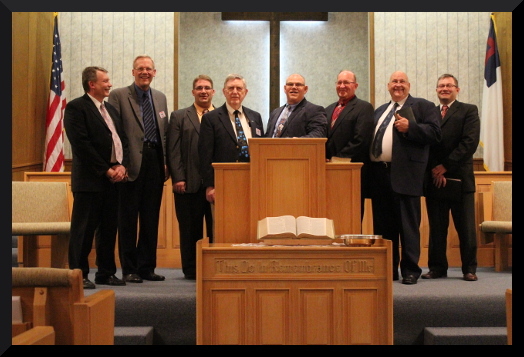 We traveled to Pontiac, Illinois for our Mission Board’s 50th anniversary. COME was started by Ed Morrell in 1968. We celebrated the event by inviting Randy Chovan to come and preach in the pavilion located in the downtown. Three people trust Christ as Savior. After the COME conference we used our car and traveled to Pierceton, Indiana to see family and update a supporting church. Memorial Day, we returned to Pontiac and our motorhome; so, we can start our long trip West to Santaquin, Utah for our first Vacation Bible School with Pastor Chris DeMorell at Santaquin Baptist Church. Thanks for praying for the Silcott Ministries for the salvation of souls and for safety on the road. After my last entry on our blog, we left for Pennsylvania for our 49th Annual COME Conference. On our way, I stopped to see my Aunt Linda in South Bend, Indiana. It was good to see her again and her son Jonathan and his family of three children. Our conference was missing several evangelists and board members because of graduations of children and grandchildren and some who had out of the USA ministry trips. Jane taught the ladies’ Sunday School and led the COME ladies’ meeting each morning. This year I was the Evangelist Rep to the board; and I served on the board on Monday and led the Evangelists’ Hour including devotions and discussions on the issues that confront the evangelists on the road in missionary evangelism. On Sunday, May 28, Caleb boarded a plane in Chicago heading for Israel for 16 days. This is a ministry of telling Bible stories on the site where the event took place. He will see the land of Israel, earn three college credits and receive a certificate in Bible Story Telling. Please pray for Caleb as he tells his five stories and for his safety in travel. Since Easter, Jane has helped her Dad and others with volunteer work. From April 17–28 and May 8-13, Jane “played with mud” at Faith Baptist Bible College and Theological Seminary in Ankeny, Iowa – she mixed the mortar and kept her Dad John Baughman supplied with bricks while he laid bricks for the remodeled seminary building. Then from May 15 – 18 and May 25 – 31 in Pierceton, Indiana, she helped her nephew Zack at his new-to-him house and her brother Pastor Jim Baughman and Dad salvage an industrial garage door and bathroom furnishings at an elementary school. (The door and partitions will be used at Bethel Baptist Church in Pierceton where her brother pastors.) On June 1, she returned to the motorhome. 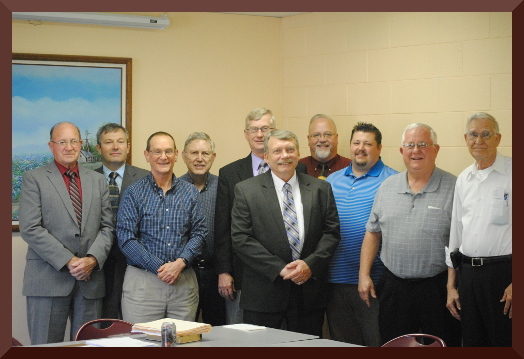 On October 18 – 22, we participated in a Round Robin Missions Conference in northern Minnesota. Our host church was Faith Baptist Church in Sauk Centre, Minnesota. Sunday night, we headed up the road to Brainerd. Then after the evening service we traveled back to our motorhome parked in Sauk Centre. Next, we spoke at Southbrook Baptist Church in Wadena; Woodland Baptist in Fergus Falls; and Grace Baptist Fellowship in Sartell. On Thursday, we all came together in Brainerd for the closing service. Each Missionary had 5 minutes for closing remarks and a challenge from the Word of God from Missionary Jim Leonard. For each service, I told a story with Rawley and introduced our whole family ministry. Then I preached a message from Acts to thank each one of the churches for their desire to be involved in missions around the world. It was enjoyable to spend time with the other missionaries. Tim Manes and his wife are beginning a Hmong church in Minneapolis. Minneapolis is home world’s largest population of Hmong in America. Roger Hatch was also with us; he has built and currently funds orphanages in Central Africa and Sierra Leone. Jim Leonard and his wife Julie were classmates of mine at Faith Baptist Bible College. Now they are veteran missionaries in northeast Brazil helping nationals as they start and lead growing churches. The final Missionary family was the Laidlaw family who are starting a church in Rice, Minnesota. 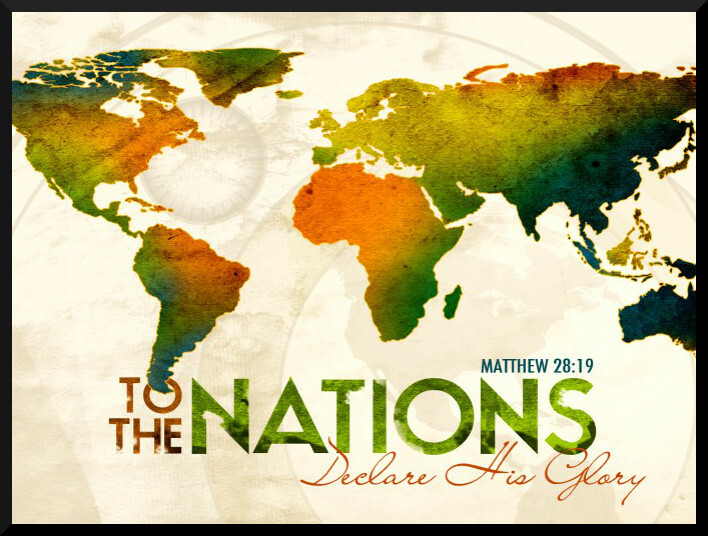 Thanks for your prayers for the Silcott ministries and missions around the World. 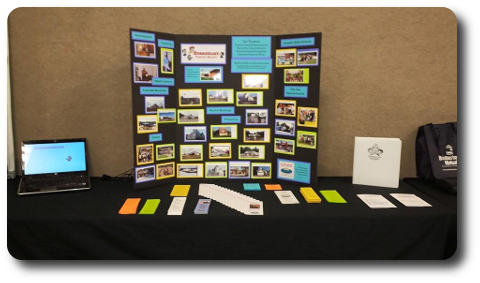 May 16 – 20, 2015 we attended our 47th annual COME Conference in Pontiac, Illinois. Because of faithful supporters and a fund raising banquet to alleviate the building debt, the home office of COME is now debt-free. It was a joy to see all of the evangelists again and get caught up on all of their ministry reports. The evangelists voted me in as their Evangelist Rep for the next two years. When I attend the board meetings, I always have a better understanding of what COME is all about and the other ministries that we are involved in around the world. On Thursday, most of the evangelists stayed at the church and we enjoyed working on each other’s trailers and partaking in a large potluck in the backyard of the church. After the evangelists all left, I stayed to preach at Calvary Baptist Church in Pontiac and give the church an update on our coming summer ministries. Our first DVBS is June 7 – 11, 2015 in Omaha, Nebraska. For April 13 & 14 I put a display out at the Iowa Association of Regular Baptist Churches state meeting. Pastor Timothy Capon is now their new state representative. Brother Timothy opened the conference with a message to challenge the pastors not to forget their first love from Revelation 2. Other speakers encouraged us to return to a healthy devotion to the gospel, remember the great commission, and rethink our theology of gospel outreach. The conference was filled with a great challenge from the Word of God as well as opportunities to see friends that I went to college with and pastors that I have held meetings for in the past. It was a joy to see my college roommate Pastor Ron Hemsworth, a new appointee with Baptist Mid- Missions going to Missionary Acres in Missouri. We also had the opportunity to meet the new president of Faith Baptist Bible College, Rev. James Tillotson. During the week I enjoyed Faith Pulpit Day on Monday, March 30, 2015. Then that evening the Missions Conference started at Faith Baptist Bible College. They had speakers from around the world that challenged the students with foreign and home missions. The keynote speakers were a testimony of Grace. Pastor Kalid Bitar is Lebanese and serves in Canada and the Middle East and Pastor Craig Hartman is Jewish and serves in New York City and Israel with Shalom ministries. It was great to see my college roommate Ron Hemsworth and dorm mates John and Dave Stillwell. Ron and his wife Joy are new appointees with Baptist Mid-Missions and are seeking to serve at Missionary Acres. Both John and Dave serve alongside their wives as missionaries in Peru. 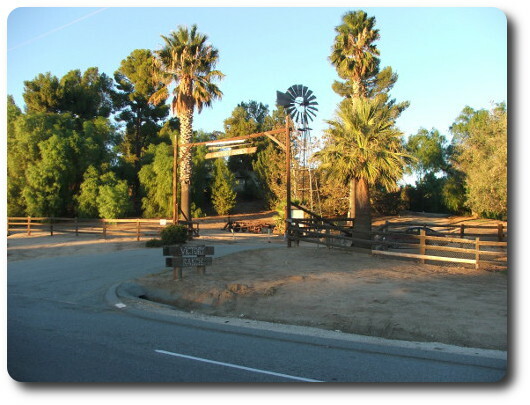 On November 1, I spoke for the Round-up the annual fall meeting for the GARB churches in southern California. In the morning I spoke to the K – 6th grade youth with Rawley and the story of Jonah. From 11:30 to 12:30, I spoke for the main service for the day. The theme for the day was “The Round Up”. I used my experience in 1987 in Montana when I helped with the cattle branding to illustrate my message challenging the saints to reach the lost. Mount Up, Ride Out, Rope ‘em, and Brand ‘em gave the challenge to throw out the lasso and reach the lost so that they can be branded (sealed) until the Savior returns. Even so come Lord Jesus. Pray for us as we head to Las Vegas, Nevada to minister at Bible Baptist Church. 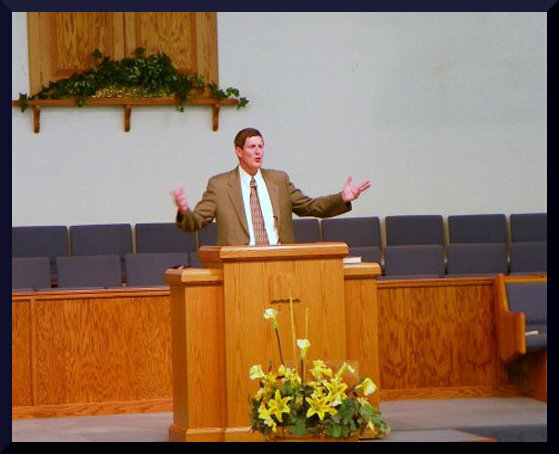 Their pastor Pete McKenzie suffered a stroke while preaching on October 5 and was promoted to Glory on October 11. This growing church needs much prayer and encouragement at this time. Pray that we can encourage them at this time of grief. From February 17  24, we had the opportunity to speak at Calvary Baptist Church in Mesa, Arizona for their missionary conference. Jane and I spoke for both Sundays for the youth Sunday School classes and childrens church in the morning and to the children again for two of the evening services during the conference. I also presented our ministry to the church and introduced Rawley and Rodney to the church family. It was a joy to be involved in a Missions Conference in a church that is excited about missions and reaching the world for Christ. Evangelist Gary Gilmore, Evangelist Doyle Robertson, Rev. Donn Mogford representing Shepherds, and Rev. David Whitcher the North American Church Planting Coordinator for Baptist Mid-Missions, all preached. Evangelist Robertson and his family also led the singing and presented the special music. On Saturday, Jane and the other missionary wives told their testimonies and enjoyed fellowshipping with the church ladies at a luncheon. Meanwhile, the men enjoyed great fellowship around a table at Golden Corral. The COME conference in Pontiac, Illinois was a blessing. Calvary Baptist Church hosted us; they provided us with a place to park all of our trailers and dinner throughout the week. Each morning the evangelists came together to talk about important issues that we face on the road in the ministry. Then at the 11:00 hour, Dr. Sumner preached on Evangelism from the Book of Acts. Each evening we heard a message from one of our COME evangelists. Just before we arrived at the COME conference, Jane broke her food just above her little toe. Because the break was so extreme, Jane had surgery on Friday. The surgeon put in a plate and four pins to hold the bone together so that it will heal properly. Please pray for Jane that her foot will quickly heal and that she will soon be back on her feet.